In this episode, Sybil Granger hires Perry to help her buy stock in her husband's oil company on the sly. Sybil wants some control of the company's action with hopes of forcing hubby's latest squeeze, Roxy Howard, out of the company and the picture altogether. Sybil spies on Roxy and gets caught by George Lutts, another investor in her husband's company. When Lutts is shot, Sybil ends up on trial for his murder. Perry has to turn to his bag of courtroom tricks to get her off the hook. CARS: 1957 Ford Skyliner retractable, black (Mason), 1957 Plymouth convertible. From The Cars by Greg Cockerill. + The Plymouth is Sybil Granger's 1957 Plymouth Belvedere Convertible with V8 engine (denoted by wide "V" on fender forward of front wheel). Screenshot at 12:09 of the episode is here. Sybil's car was produced after mid-Jan 57: a close look at 12:17 shows that it had six pairs of narrow vertical slots in the underpan behind the licence plate, like this. Cars produced before mid-Jan 57 had six wide slots, which apparently let in too many gophers to plug up the radiator. The 57 Plymouth had very good handling thanks to its new "Torsion-Aire Ride" which included torsion bar Front Suspension. Read about the car here. See Comments section for "1957 Headlight Oddities". & At 16:10 we see the Drake Detective Agency radio car manned by two of Paul's agents. It's a black 1957 Lincoln Premiere 4-Door Sedan. Another photo here. Added by Gary Woloski, 5/17/12. Anomaly: Robert Bice is listed as Hurley in the closing credits but is identified as Frank Faulkner by Paul Drake. In this show George Lutts complains to his daughter and son-in-law because steak costs $1.34 a pound. Can you imagine what he would have to say about today�s prices? Submitted by PaulDrake33, 6/25/2008. The (shooting?) script for this episode is dated 10 June 1957. At least 7 episodes have scripts dated earlier. So while it was the 3rd episode broadcast, it was probably no earlier than the 8th filmed. Submitted by billp, 3 November 2009. Uncredited Actors: Don Anderson makes his third Mason appearance here (unless you count episode 2 twice, since he was in two places in the courtroom). He�s a courtroom spectator seated directly behind Herbert Dean played by Robert Cornthwaite. (See Uncredited Actors). Submitted by FredK 29 September 2010. + In an initial long shot of the courtroom, he appears in the back row, but then in a closer cut to Burger, he disappears. Submitted by gracenote, 8/23/2011. Sightings: Blue Collar Guy can be seen with his arm on the back of an attractive young brunette among the spectators exiting from the first aborted hearing, while Tragg is stalling Mason in the foreground. (See Who Is That?) Submitted by alan_sings 30 September 2010. + (Also Continuity Error:) In the courtroom gallery during the first hearing, we find Distinguished Genetleman #1 in the back row, Distinguished Gentleman #2 in the front row, on the prosecutor�s side. In the second hearing the two gentlemen sit together in the back row on the other side of the courtroom�that is until DG #1 shows up again on Burger�s side when he calls a witness. Submitted by gracenote, 8/23/2011. +We find Distinguished Lady #4 in her favorite spot in the back row on Perry's side of court. Submitted by BigBill767, Nov 11, 2016. 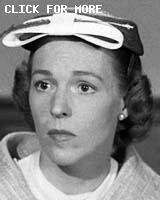 Syndication cuts: Opening scene with Harriet, Bruce and Roxy; Sybil leaving her car and catching a cab; after checking her car for the gun, Sybil grabs her sweater from the seat and the binoculars fall out; conversation between Tragg, Mason and Sybil where Tragg takes Sybil to the D.A. ; Della commenting that Burger left a vapor trail, Mason saying he didn't fool Burger, Mason accusing Sybil of lying about the distance of the shot and Tragg issuing another warrant against Sybil; Mason and Drake driving up to the shack; scene with Burger and Tragg and the binoculars, where Burger calls Tragg a peeping Tom and Tragg informs Burger about Lutts' and Sybil's fingerprints on the binoculars. Additional Hallmark cuts: Part of the dinner conversation when Lutts asks Herbert about Sybil "Did you see her there or didn't you?" and Vinnie says "every day last week"; Burger complaining about endless and purposeless cross examinations; Mason questions Sybil about the distance of the shot; cabbie being sworn in; cabbie saying he took Sybil to Brent building; Bruce asking Mason if he can help and Mason saying he's a little late; conversation between Vinnie and Herbert after Perry, Della and Paul leave; Burger's first objection to Mason's shooting-the-blank demonstration; Mason's telling Sybil to keep a poker face and Ruth being sworn in; Ruth saying she's Sybil's friend and Burger asking if the relationship goes farther. Submitted by Wiseguy70005, 7/04/12. + In the syndicated version I recorded on 7 Mar 2014 on MeTV, it went from Sybil and Ruth getting in the cab to four minutes twenty seconds of commercials, then to the start of the trial. We never do learn why Burger considered Sybil to be a suspect. Submitted by Alan Smithee, 3-10-2014. Gun: The murder weapon was a Colt Official Police. Submitted by oldgray, 2/27/2014. In the novel the murder was committed on June 3rd. In the episode the date was May 3rd. In both the novel and episode Roxy returned the gun to Sybil's husband on May 30th. So in the novel she returned the gun four days before the murder and in the episode almost a month afterward. Submitted by Wiseguy70005, 1/20/15. + Good question. I guess it's for Society of Cinema Hairstylists, Inc., see for example here, incorporated in California, on April 7, 1955, and now dissolved. However, I didn't see Annabell's name listed in the episode's credits on the 2006 Paramount DVD, only Mel Berns, so I wonder how her name got listed here as an accomplice. lowercase masonite, 2/2/16. + Annabell has 247 PM "Makeup Dept." credits, including "Nervous Accomplice," her 2nd IMDb citation. You're right: she's Not listed in the Closing credits: I must have found her on the IMDb list. Mike Bedard 7.12.16. Perry has a workshop? In other episodes we've seen his office in the Brent building and we've seen his apartment. But this is the first (and only) time we hear that Perry has a workshop. Perry tells Paul to collect all the wood and pipes for the shooting stand and bring them to his workshop. Submitted by Kilo 2/22/2018. The purchasing power of $1.34 in 1957 would be $19.87 in 2007. What's the price of a rib-eye, porterhouse, or New York strip today? Submitted by billp, 12/26/2008. How much did Lutts sell that stock to Perry for? About $32,727.27. That means Sybil Granger came up with about $241,056.40 in 2007 dollars. Not bad. Her $2.95 taxi ride(s) would be about $21.73. Taxis were clearly a lot more economical back then. And the drivers spoke English, too! A million dollars would be $4,365,612.79 in 2007 dollars. No wonder Roxy is so upset!! Submitted by billp, 12/27/2008. Sybil Granger is the second person whose gun is stolen from the glove compartment of her car. (Do all Americans keep their guns there? Why?) Submitted by evelyne, 2/4/2011. + I think it�s just Californians, who also (according to this series) buy rifles at office sopply stores so they can shoot the Man when he comes onto their orange grove / dying farm / oil field / salted mine. 1957 Headlight Oddities. Until 1957, US federal and state laws only permitted two headlights on automobiles. For the 1957 Model Year, each of the Big Three automakers planned to introduce Quad Headlights on some models. However, by Sept 1956 (debut time for the '57 models) about eight states had not yet amended their regulations to permit these headlights. The automakers' fallback for the non-quad states was to install one conventional pre-57 High/Low-beam unit on each side and to install Parking, Driving or Turn-Signal lights in the two left-over headlight stations. These "Quasi-Quads" ended up looking like this on the Plymouth and this on the Lincoln. I have read one account that California was the last state to legalize Quad Headlights, apparently doing so in Dec '56. The next appearance of a car affected by this headlight confusion is in Ep#5 (Frances Celane's '57 Chrysler Imperial Crown Convertible). Added by Gary Woloski, 5/17/12. + Had to add a comma before Mrs. Granger's name; otherwise, your doctor or lawyer could be lying to Mrs. Granger. Submitted by Wiseguy70005, 3/29/15. If Albert Tydings (TCOT Baited Hook, #14) is the most compliant corpse in series history, George Lutts is the most courteous. Just seconds before he's shot in the open field, he meets Sybil Granger with his hat in his hand. After being shot, he manages to hold on to his hat, even after dropping to the ground. Sybil rewards his extraordinary display of gentlemanliness by immediately fleeing from the scene. Submitted by BobH, 25 December 2015. Perry At His Best: "I'll Do Everything I Can To Help," he tells Client Sybil: he did the Same in the other 270 cases. Mike Bedard 7.12.16 MeTV viewing. This was the first instance in the series - and one of very few, eventually - where we actually see the murder take place...more to the point, we see it can't be Ms. Granger who is the murderer. Although that can't be said to be much of a spoiler - given the format of the show - it nevertheless eliminates a small amount of dramatic tension, and certain possibilities for dialogue. As with many PM shows, one must forgive certain gaps in logic: Why, on the eve of a multi-million dollar oil deal, would Lutts sell any of his stock to anyone at any price? Roxie testifies that she thought Sybil was the intended target because she was the one blocking the oil deal. But Roxie knew the stock was in Perry's name - it was Perry who was blocking the deal, not Sybil. Finally, if Lutts was the intended victim all along, how could our killer know Lutts would ever be in just the right spot at just the right time? Guns: Seems like the courts back then were pretty lax about firing off guns in the courtroom. Perry fires the blank in this episode and in at least one other episode a gun was fired in the courtroom. The ballistics expert Mr. Redfield was careful to push away the barrel of the gun Perry was holding so that it wasn't pointing at him. However, just a few minutes earlier Burger had the gun pointed directly at Redfield's chest but he made no similar correction of Burger. Kilo 11/25/2018.